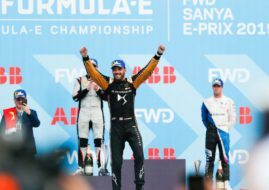 Lucas Di Grassi won the first race of the Montreal ePrix to take the lead in the Formula E Championship before the final race of the season. The Brazilian of the Abt Schaeffler Audi Sport Team scored his only the second win of the season and took the lead in the points from the reigning champion Sebastien Buemi. The beginning of the final round was quite exciting. Lucas Di Grassi won the pole position, beating the championship leader Sebastien Buemi. Nevertheless, the Swiss driver and the title defender was hit by a 10-place grid penalty. Buemi crashed so bad during FP2 that battery of his car had to be changed, so the Renault e.Dams drivers started from 12th position. However, the bad news doesn’t stop there, as it was discovered in post-qualifying checks that Nico Prost’s car was underweight and his Super Pole times have been disqualified, so the Frenchman started from P11. 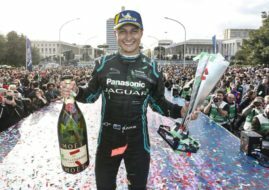 While Di Grassi started well to keep his lead in front of Stephane Sarrazin, Felix Rosenqvist, and Mitch Evans, Buemi had an awful start and dropped to the 16th position. The first half of the race was relatively quiet and accident-free until the lap 14. Loic Duval and Nick Heidfeld collided what caused the full course yellow and most of the drivers pitted earlier than it was planned. When the race was restarted, Di Grassi still was the race leader with a solid advantage to two Techeetahs of Jean-Eric Vergne and Stephane Sarrazin behind him. At the same time, nervous Buemi moved up to the 8th, even after he had some skirmishes with Daniel Abt. With 10 laps to go, Jose Maria Lopez crashed into the wall while running 9th and the safety car was deployed. After another restart, Buemi progressed to the 5th after overtaking his teammate Nico Prost. Soon after Buemi was on P4 after overtaking Rosenqvist and tried to reach the podium but Sarrazin battled hard to hold-off the somewhat frustrated title contender. Di Grassi also was put under the pressure by Vergne late in the race but was calm enough to take the chequered flag. A few hours after the race finished news broke that Buemi’s second car, which the team had worked so hard to complete, was underweight. The stewards took into consideration the difficult circumstances Renault e.dams was forced to work under before concluding that a four kilo discrepancy was too much to ignore. The penalty was disqualification. This means that from 10 points ahead, Buemi is now 18 points behind. The final race of the 2016-2017 Formula E season starts Sunday, 16.00 local time (22.00 CET).